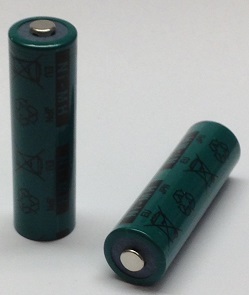 HR-3U-2700 : 1.2volt 2700mAh rechargeable Ni-MH battery cells. Choose Plain (button Top), or with Solder Tabs (for assembly - $ 0.25 extra per cell). 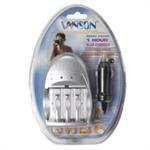 Ideal for use in Digital Cameras, GPS, or any other digital device. They can be recharged in regular Ni-MH chargers, such as the V-1000, MH-C801D, BC-MQN10A, etc. Premium quality, longest lasting, memory-free ! As of 2015, all the new, fresh stock is green-jacketed, as pictured here. The 4AAcase is a See-thru clamshell case for 4 x AA battery cells. Holds Alkalines, Ni-Cds, Ni-MHs, any AA cells. Snaps open & closed. A must-have for safe storage of spare cells when on the go! $ 1.00 each ! V-1000 : Fast-Smart Charger for AA and AAA batteries, Charges Ni-MH and Ni-Cd batteries. V-1000: Fast-smart charger for AA and AAA batteries. Charges NiMH and NiCd cells; charges 2 or 4 at a time. Runs on AC and DC power - charge at home (plug into wall) OR mobile (plug into 12VDC socket) ! 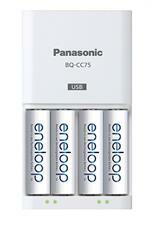 V-6500 : ULTRA-FAST Smart Charger for up to 4 AA or AAA Ni-MH batteries. Charges each cell INDIVIDUALLY. 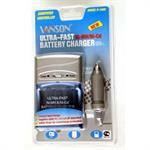 V-6500: Fast Smart Charger for your AA & AAA NiMH batteries. Charges each cell individually; has 4 separate smart-charging channels. Charges 1, 2, 3, or 4 cells at a time. Automatic channel shut-off when each particular battery is full. 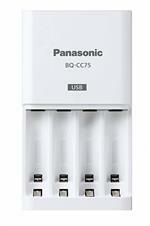 BQ-CC75: UPGRADE Smart Charger for AA & AAA NiMH cells. Charges 1,2,3 or 4 cells at a time. Charges AA & AAA size NiMH / NiCd cells. Smart charge with automatic shut off when batteries are full. Has LED charge status indicators. Has USB2.0 1A charge port. MH-C800S: Quick Charger for up to 8 AA & AAA batteries. Charges/conditions up to 8 cells INDIVIDUALLY. Since each channel operates independently, any qty of cells (1 thru 8) or capacity variance or size mix can be inserted. MH-C801D : Professional Charger for up to 8 x AA & AAA NiMH & NiCd cells. Has 8 independent Charging channels ! MH-C801D : Professional-Grade Smart Charger for AA & AAA NiMH & NiCd cells. Provides Rapid Smart-charging (1-2 hrs) & conditioning for 1 through 8 cells. MH-C808M : Premium Professional Charger for 1 - 8 NiMH/NiCd cells - works for AAA, AA, C, & D sizes. Has 8 independent Charging channels ! The MH-C808M is a Professional Rapid Charging/Conditioning system for up to 8 NiMH or NiCd battery cells. Works for AAA, AA, C, & D sizes. Charger has 8 individual smart-charge channels - each battery is charged indivudually!